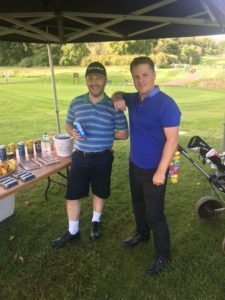 Proud to support the 8th Annual Charity Golf Day for Oracle Trust again, which was held on the 28th September at the stunning Burhill Golf Club in Surrey. 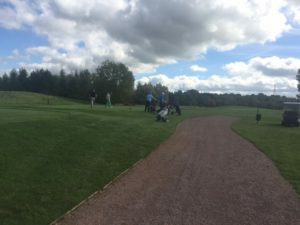 The 18 teams enjoyed the challenging New Course and we were fortunate to have a mild Autumn day with light winds for perfect playing conditions. I played with clients so it was a lovely opportunity to catch up. The winner scored a huge 45 points, sadly that wasn’t me! The afternoon lunch was accompanied by the entertainment from the hilarious Aaron James. Players enjoyed a number of fun competitions on the course including “Beat the Lady Pro”, “Shark Attack” ( chipping which was harder than it looked ) competition, longest drive and two nearest the pin prizes. Delighted that the event raised in excess of £5,000 to support vital research programmes into head and neck cancer. The day honours one of my favourite clients and all round top chaps, who we sadly lost last year Mr Derek Lucie-Smith. The lucky winner of the Golden Ticket, Hugo is pictured here being measured up for his bespoke shirt.